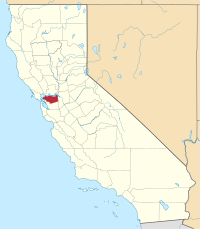 Contra Costa County is a county in the state of California in the United States. As of the 2010 census, the population was 1,049,025. The county seat is Martinez. It occupies the northern portion of the East Bay region of the San Francisco Bay Area, and is primarily suburban. The county's name is Spanish for "opposite coast", referring to its position on the other side of the bay from San Francisco. Contra Costa County is included in the San Francisco–Oakland–Hayward, CA Metropolitan Statistical Area. In prehistoric times, particularly the Miocene epoch, portions of the landforms now in the area (then marshy and grassy savanna) were populated by a wide range of now extinct mammals, known in modern times by the fossil remains excavated in the southern part of the county. In the northern part of the county, significant coal and sand deposits were formed in even earlier geologic eras. Other areas of the county have ridges exposing ancient but intact (not fossilized) seashells, embedded in sandstone layers alternating with limestone. Layers of volcanic ash ejected from geologically recent but now extinct volcanoes, compacted and now tilted by compressive forces, may be seen at the site of some road excavations. This county is an agglomeration of several distinct geologic terranes, as is most of the greater San Francisco Bay Area, which is one of the most geologically complex regions in the world. The great local mountain Mount Diablo has been formed and continues to be elevated by compressive forces resulting from the action of plate tectonics and at its upper reaches presents ancient seabed rocks scraped from distant oceanic sedimentation locations and accumulated and lifted by these great forces. Younger deposits at middle altitudes include pillow lavas, the product of undersea volcanic eruptions. There is an extensive but little-recorded human history pre-European settlement in this area, with the present county containing portions of regions populated by a number of Native American tribes. The earliest definitively established occupation by modern man ( Homo sapiens) appears to have occurred six to ten thousand years ago. However, there may have been human presence far earlier, at least as far as non–settling populations are concerned. The known settled populations were hunter-gatherer societies that had no knowledge of metals and that produced utilitarian crafts for everyday use (especially woven reed baskets) of the highest quality and with graphic embellishments of great aesthetic appeal. Extensive trading from tribe to tribe transferred exotic materials such as obsidian (useful for the making of arrowheads) throughout the region from far distant Californian tribes. Unlike the nomadic Native American of the Great Plains it appears that these tribes did not incorporate warfare into their culture but were instead generally cooperative. Within these cultures the concept of individual or collective land ownership was nonexistent. Early European settlers in the region, however, did not record much about the culture of the natives. Most of what is known culturally comes from preserved contemporaneous and excavated artifacts and from inter-generational knowledge passed down through northerly outlying tribes of the larger region. Early interaction of these Native Americans with Europeans came with the Spanish colonization via the establishment of missions in this area, with the missions in San Jose, Sonoma, and San Francisco and particularly the establishment of a Presidio (a military establishment) in 1776. Although there were no missions established within this county, Spanish influence here was direct and extensive, through the establishment of land grants from the King of Spain to favored settlers. Rancho Canada de los Vaqueros was granted to Francisco Alviso, Antonio Higuera, and Manuel Miranda (26,660 acres (107.9 km2) confirmed in 1889 to heirs of Robert Livermore). Two ranchos, both called Rancho San Ramon, were granted by the Mexican government in the San Ramon Valley. In 1833, Bartolome Pacheco (southern San Ramon Valley) and Mariano Castro (northern San Ramon Valley) shared the two square league Rancho San Ramon. Jose Maria Amador was granted a four square league Rancho San Ramon in 1834. In 1834 Rancho Monte del Diablo (present day Concord, California) was confirmed with 17,921 acres (72.5 km2) to Salvio Pacheco (born July 15, 1793, died 1876). The Pacheco family settled at the Rancho in 1846 (between the Pacheco shipping port townsite and Clayton area, and including much of Lime Ridge). The boundary lines were designated with stone markers. Clayton was later located on sobrante lands just east of Rancho Monte del Diablo ( Mount Diablo). In 1834, Rancho Arroyo de Las Nueces y Bolbones, aka Rancho San Miguel (present day Walnut Creek), was granted to Juana Sanchez de Pacheco, in recognition of the service of Corporal Miguel Pacheco 37 years earlier (confirmed 1853, patented to heirs 1866); the grant was for two leagues, but drawn free hand on the diseño/map, and reading "two leagues, more or less" as indicated in the diseño, but actually including and confirmed for nearly four leagues or nearly 18,000 acres (72.8 km2), but only 10,000 acres (40.5 km2) were ever shown as having once belonged to Juana Sanchez. 'Meganos' means 'sand dunes.' A "paraje que llaman los Méganos" 'place called the sand dunes' (with a variant spelling) is mentioned in Durán's diary on May 24, 1817. Two Los Meganos Ranchos were granted, later differentiated as Rancho Los Meganos (1835, three leagues or at least 13,285 acres (53.8 km2)) in what is now the Brentwood area, to Jose Noriega then acquired by John Marsh; and Rancho Los Medanos (to Jose Antonio Mesa and Jose Miguel Garcia, Pittsburg area, dated November 26, 1839). This led to the Bear Flag Revolt in 1846 when about 30 settlers originally from the United States declared a republic in June 1846 and were enlisted and fighting under the U.S. flag by July 1846. Following the Mexican–American War of 1846–48, California was controlled by U.S. settlers organized under the California Battalion and the U.S. Navy's Pacific Squadron. After some minor skirmishes California was under U.S. control by January 1847 and formally annexed and paid for by the U.S. in 1848. By 1850 the over-100,000 population and rapidly growing California population gain due to the California gold rush and the large amount of gold being exported east gave California enough clout to choose its own boundaries, write its own constitution and be admitted to the Union as a free state in 1850 without going through territorial status as required for most other states. Postcard showing the Contra Costa County Courthouse in 1906. Contra Costa County was one of the original 27 counties of California, created in 1850 at the time of statehood. The county was originally to be called Mt. Diablo County, but the name was changed prior to incorporation as a county. The county's Spanish language name means opposite coast, because of its location opposite San Francisco, in an easterly direction, on San Francisco Bay. Southern portions of the county's territory, including all of the bayside portions opposite San Francisco and northern portions of Santa Clara County, were given up to form Alameda County effective March 25, 1853. The land titles in Contra Costa County may be traced to multiple subdivisions of a few original land grants. The grantee's family names live on in a few city and town names such as Martinez, Pacheco and Moraga and in the names of streets, residential subdivisions, and business parks. A few mansions from the more prosperous farms have been preserved as museums and cultural centers and one of the more rustic examples has been preserved as a working demonstration ranch, Borges Ranch. With the postwar baby boom and the desire for suburban living, large tract housing developers would purchase large central county farmsteads and develop them with roads, utilities and housing. Once mostly rural walnut orchards and cattle ranches, the area was first developed as low-cost, large-lot suburbs, with a typical low-cost home being placed on a "quarter-acre" (1,000 m²) lot — actually a little less at 10,000 square feet (930 m²). Some of the expansion of these suburban areas was clearly attributable to white flight from decaying areas of Alameda County and the consolidated city-county of San Francisco, but much was due to the postwar baby boom of the era creating demand for three- and four-bedroom houses with large yards that were unaffordable or unavailable in the established bayside cities. A number of large companies followed their employees to the suburbs, filling large business parks. The establishment of a large, prosperous population in turn fostered the development of large shopping centers and created demand for an extensive supporting infrastructure including roads, schools, libraries, police, firefighting, water, sewage, and flood control. The establishment of BART, the modernization of Highway 24, and the addition of a fourth Caldecott Tunnel bore all served to reinforce the demographic and economic trends in the Diablo area, with cities such as Walnut Creek becoming edge cities. The central county cities have in turn spawned their own suburbs within the county, extending east along the county's estuarine north shore; with the older development areas of Bay Point and Pittsburg being augmented by extensive development in Antioch, Oakley, and Brentwood. The effects of the housing value crash (2008–2011) have varied widely throughout the county. Values of houses in prosperous areas with good schools have declined only modestly in value, while houses recently built in outlying suburbs in the eastern part of the county have experienced severe reductions in value, accelerated by high unemployment and consequent mortgage foreclosures, owner strategic walk-aways, and the too-rapid conversion of neighborhoods from owner-occupancy to rentals. 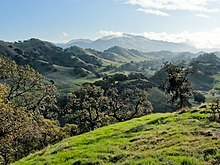 Contra Costa County's physical geography is dominated by the bayside alluvial plain, the Oakland Hills– Berkeley Hills, several inland valleys, and Mount Diablo, an isolated 3,849-foot (1,173 m) upthrust peak at the north end of the Diablo Range of hills. The summit of Mount Diablo is the origin of the Mount Diablo Meridian and Base Line, on which the surveys of much of California and western Nevada are based. The Hayward Fault Zone runs through the western portion of the county, from Kensington to Richmond. The Calaveras Fault runs in the south-central portion of the county, from Alamo to San Ramon. The Concord Fault runs through part of Concord and Pacheco, and the Clayton-Marsh Creek-Greenville Fault runs from Clayton at its north end to near Livermore. These slip-strike faults and the Diablo thrust fault near Danville are all considered capable of significantly destructive earthquakes and many lesser related faults are present in the area that cross critical infrastructure such as water, natural gas, and petroleum product pipelines, roads, highways, railroads, and BART rail transit. The most notable natural landmark in the county is 3,849 feet (1,173 m) Mount Diablo, at the northerly end of the Diablo Range. Mount Diablo and its neighboring North Peak are the centerpiece of Mt. Diablo State Park (MDSP), created legislatively in 1921 and rededicated in 1931 after land acquisitions had been completed. At the time this comprised a very small portion of the mountain. In the 1960s the open space of the mountain was threatened with suburban development expanding from the surrounding valleys. In 1971, when MDSP included 6,788 acres (27.5 km2), the non-profit organization Save Mount Diablo was formed and open space preservation accelerated. MDSP was the first of twenty-nine Diablo area parks and preserves created around the peaks, today totaling more than 89,000 acres (360 km2). These Diablo public lands stretch southeast and include the Concord Naval Weapons Station, Shell Ridge Open Space and Lime Ridge Open Spaces near Walnut Creek, to the State Park, and east to the Los Vaqueros Reservoir watershed and four surrounding East Bay Regional Park District preserves, including Morgan Territory Regional Preserve, Brushy Peak Regional Preserve, Vasco Caves Regional Preserve, and Round Valley Regional Preserves. The new Marsh Creek State Park (California), formerly known as Cowell Ranch State Park, and Black Diamond Mines Regional Preserve, are among the open spaces stretching back to the north. In this way the open spaces controlled by cities, the East Bay Regional Park District, Mount Diablo State Park, and various regional preserves now adjoin and protect most of the elevated regions of the mountain. The name Mount Diablo is said to originate from an incident involving Spanish soldiers who christened a thicket ‘Monte del Diablo’ when natives they were pursuing apparently disappeared in the thicket. Anglo settlers later misunderstood the use of the word ‘monte’ (which can mean ‘mountain’, or ‘thicket’), and fastened the name on the most obvious local landmark. According to the Contra Costa Times, in 2011, there were rumors that Contra Costa County was going to rename the Mountain, "Mt. Ronald Reagan" or "Mt. Reagan", after the former California Governor. There were also multiple petitions that were created by citizens to change the name of the mountain, once in 2005 and another in 2011. As of the census  of 2000, there were 948,816 people, 344,129 households, and 242,266 families residing in the county. The population density was 1,318 people per square mile (509/km²). There were 354,577 housing units at an average density of 492 per square mile (190/km²). The largest ethnicites were 9.0% German, 7.7% Irish, 7.3% English and 6.5% Italian ancestry according to Census 2000. 74.1% spoke English, 13.1% Spanish, and 2.6% Tagalog. By 2005, 53.2% of Contra Costa County's population were non-Hispanic whites. African-Americans made up 9.6% of the population, while Asians constituted 13.1% of it. Latinos were now 21.1% of the county population. In 2000, there were 344,129 households out of which 35.4% had children under the age of 18 living with them, 54.5% were married couples living together, 11.5% had a female householder with no husband present, and 29.6% were non-families. 22.9% of all households were made up of individuals and 8.00% had someone living alone who was 65 years of age or older. The average household size was 2.72 and the average family size was 3.23. 11.3% who were 65 years of age or older. The median age was 36 years. For every 100 females there were 95.4 males. For every 100 females age 18 and over, there were 92.2 males. Males had a median income of $52,670 versus $38,630 for females. The per capita income for the county was $30,615. About 5.4% of families and 7.6% of the population were below the poverty line, including 9.8% of those under age 18 and 6.0% of those age 65 or over. Since 1932, Contra Costa County has been a Democratic stronghold in presidential elections, though it did experience a temporary Republican trend in the 1970s and 1980s, with successive wins by Richard Nixon in 1972, Gerald Ford in 1976, and Ronald Reagan in 1980 and 1984, the last Republican presidential candidate to win the county. According to the California Secretary of State, as of October 24, 2016, Contra Costa County has 607,515 registered voters, out of a population of 1,037,817 (58.5%). Of those, 306,029 (50.4%) are registered Democrats, 132,405 (21.8%) are registered Republicans, and 143,876 (23.7%) have declined to state a political party, also known as "No Party Preference" or "NPP." Democrats hold wide voter-registration advantages in all political subdivisions in Contra Costa County. The Democrats' largest registration advantage in Contra Costa is in the cities of Richmond where there is a 60.3% registration advantage with only 3,192 Republicans (6.2%) out of 51,395 registered voters compared to 34,159 Democrats (66.5%) and 12,095 voters who have no party preference (23.5%), El Cerrito where there is a 59.0% registration advantage with only 1,169 Republicans (7.4%) out of 15,877 registered voters compared to 10,543 Democrats (67.6%) and 3,654 voters who have no party preference (23.0%), and San Pablo where there is a 58.3% registration advantage with only 641 Republicans (6.1%) out of 10,550 registered voters compared to 6,793 Democrats (64.4%) and 2,746 voters who have no party preference (26.0%). The great rancheros of the Spanish period were divided and sold for agricultural uses, with intensively irrigated farming made possible in some areas by the development of canals that brought water from the eastern riverside portions of the county to the central portion. Other areas could used the more limited water available from local creeks and from wells. Orchards dominated where such water was available, while other, seasonally dry areas were used for cattle ranching. In central parts of the county walnuts were an especially attractive orchard crop, using the thin-shelled English Walnut branches grafted to the hardy and disease-resistant American Walnut root stock. In the Moraga region, pears dominated, and many old (but untended) roadside trees are still picked seasonally by passers-by. In eastern county, stone fruit, especially cherries, is still grown commercially, with seasonal opportunities for people to pick their own fruit for a modest fee. The Contra Costa Canal, a concrete-lined and fenced irrigation canal still makes a loop through central county and provided industrial and agricultural grade water to farms and industry. While no longer used for extensive irrigation, it is still possible for adjoining landowners (now large suburban lot owners) to obtain pumping permits. Most of this water is destined for the heavy industry near Martinez. As with the railroad rights of way there is now an extensive public trail system along these canals. The development of commuter railroads proceeded together with the subdivision of farms into parcels. In some cases, such as the development of Saranap, the same developer controlled both the railroad ( Sacramento Northern) and the development. These early suburbanization developments were an extension of the earlier development of trolley car suburbs in what are now considered the highly urban environments of the near East Bay. Owing to its extensive waterfront on San Francisco, San Pablo, and Suisun bays the northwestern and northern segments have long been sites for heavy industry, including a number of still active oil refineries (particularly Chevron in Richmond, Shell Oil and Tesoro - in Martinez), chemical plants ( Dow Chemical) and a once substantial integrated steel plant, Posco Steel (formerly United States Steel), now reduced to secondary production of strip sheet and wire. The San Joaquin River forms a continuation of the northern boundary turns southward to form the eastern boundary of the county. Some substantial Sacramento-San Joaquin Delta "islands" (actually leveed former marshes) are included in this corner of the county. The West County is the area near or on San Francisco and San Pablo bays. The housing stock in the region was extensively developed after the great San Francisco earthquake of 1906. Much of the housing stock in these areas is becoming quite expensive. As an alternative to moving to either the expensive central county, or the too-distant East County, this area is becoming gentrified, with a mix of races and income levels — a character actively sought by some housing purchasers. The downside of this is a corresponding lack of affordable housing for those in lower paying service jobs — a problem endemic throughout the region. There has recently been a housing boom or tract housing in Richmond and also in the Hercules areas. These gentrifying areas are the most diverse in Contra Costa County. The central part of the county is a valley traversed by Interstate 680 and Highway 24. The towns east of the hills, on or near Highway 24 and their surrounding areas ( Lafayette, Moraga and Orinda) are collectively known as Lamorinda. The major central county cities along Interstate 680 are Martinez, Concord, Pleasant Hill, Walnut Creek, Danville, San Ramon, and unincorporated Alamo. Owing to the high quality of its public schools (due largely to both demographics and added support from prosperous parents), this area has become a magnet for well–off families with children. During the real estate boom, housing prices were driven to astounding levels. From 2007, home prices in the region have seen substantial decreases and the affordability rate has risen. During the real estate boom, the high price of homes and scarcity of land resulted in many speculators purchasing older, smaller homes and partially or completely tearing them down to construct larger homes. In this way the central county region has become a mix of older suburbs, newer developments, small lot "infill" developments, and extensive shopping areas. Lower cost modern tract developments continue along Suisun Bay in the "East County" towns of Pittsburg, Antioch, and Oakley - new "bedroom" communities" to serve the now "edge cities". The median income of a family in the two relatively affluent East County towns of Brentwood and Discovery Bay is approaching $100k/yr. placing them in the top fifteen percent of affluent towns in the United States. California Distinguished Schools, golf courses, vineyards, and upscale homes are found in Brentwood and Discovery Bay. Discovery Bay is based on a waterfront community of 3,500+ homes with private docks with access to the Sacramento-San Joaquin River Delta. Discovery Bay also features gated and non-gated "off-water" communities with homes from 1,400 square feet (130 m2) up to 4,700 square feet (440 m2). The Streets of Brentwood, an outdoor lifestyle retail center, opened in Brentwood in the Fall of 2008. The Streets of Brentwood's upscale shops include Banana Republic, Coldwater Creek, DSW Shoes, Jos. A. Bank, REI, Swarovski, Victoria’s Secret, and White House/Black Market. The only all-digital Rave Motion Pictures (since acquired by AMC Theaters and renamed) in the San Francisco Bay Area is located in the Streets of Brentwood. In 2011, Vasco Road is undergoing further construction/improvement to reduce the driving time between East County/Brentwood and Livermore. Highway 4 is currently undergoing multimillion-dollar improvements that are scheduled to add lanes through Brentwood, Antioch and Pittsburg by 2015 to reduce the driving time between East County and Concord/Walnut Creek. Contra Costa County Library is the county's library system. The city of Concord is served by the daily newspaper, the Contra Costa Times published by the Bay Area News Group-East Bay (part of the Media News Group, Denver, Colorado), with offices in Walnut Creek. The paper was originally a paper run and owned by the Lesher family. Since the death of Dean Lesher in 1993, the paper has had several owners. The publisher also issues weekly local papers, such as the Concord Transcript, which is the local paper for Concord and nearby Clayton. Prior to 1903 most travel to central Contra Costa County was by boat or rail to Martinez on the northern waterfront and from there to the industrial areas east along the waterfront as well as farming regions to the south. In 1903 the first tunnel through the Oakland hills (now Old Tunnel Road) was built, principally as a means of bringing hay by horse, mule, or ox-drawn wagons from central and eastern agricultural areas to feed the draft animals that provided the power to public and private transportation in the East Bay at the time. The tunnel exited in the hills high above the crossroads of Orinda with the road continuing on to Lafayette, Walnut Creek, and Danville. The road was just wide enough for one car in each direction, and had no shoulders. In 1937 the two-bore Caldecott Tunnel for road vehicles was completed, making interior Contra Costa County much more accessible. After World War II the tunnels allowed waves of development to proceed, oriented toward Oakland rather than the northern shoreline, and the northern shoreline cities began to decline. The tunnel has since been augmented with a third bore, completed in 1964, and a fourth, completed in 2013. Amtrak runs its San Joaquins line to Southern California and Capitol Corridor line to Sacramento and San Jose through stations in Richmond, Martinez, and Antioch-Pittsburg. BART High speed commuter rail system, which functions as the Bay Area's metro system. eBART (short for East Contra Costa County BART Extension) is designed to bring rapid transit services along the Highway 4 corridor. AC Transit provides local service in West County and in Orinda, in addition to western Alameda County, Transbay commuter services to San Francisco, bus rapid transit lines and the bulk of All Nighter service for the East Bay. County Connection provides local service in Central C.C. County and connecting services to Dublin and Pittsburg. Tri-Delta Transit provides local bus service in East C.C. County and connecting regional services to Martinez, Livermore, and Stockton. WestCAT provides local bus service in northern West C.C. County with connecting service to BART and transbay service to the city (San Francisco). Golden Gate Transit provides connecting transbay service between San Rafael and Richmond and El Cerrito del Norte BART stations via the Richmond-San Rafael Bridge. Vallejo Transit and Fairfield and Suisun Transit provide regional feeder service to El Cerrito del Norte BART from Solano County. Benicia Transit provides commuter service between the Vallejo Ferry Terminal and BART in Concord through Benicia in Solano County. Concord Airport now houses two charter airlines that offer on-demand passenger service to select destinations in California and Nevada. Formed in 1909, the Oakland Antioch Railway was renamed the Oakland Antioch & Eastern Railway in 1911. It extended through a 3,400-foot (1,000 m) tunnel in the Oakland Hills, from Oakland to Walnut Creek, Concord and on to Bay Point. The current owner of the Santa Fe Railroad's assets, BNSF Railway has the terminus of its transcontinental route in Richmond. Originally built by the San Francisco and San Joaquin Valley Railroad in 1896, the line was purchased by the Atchison, Topeka and Santa Fe Railway shortly thereafter. The line leaves Richmond through industrial and residential parts of West County before striking due east through Franklin Canyon and Martinez on its way to Stockton, Bakersfield and Barstow. These railroads spurred the development of industry in the county throughout the late 19th and early 20th centuries, particularly driving development of the Standard Oil (now Chevron) refinery and port complex in Richmond. There were a large number of short lines in the county between the late 19th century and the early 20th century. The rights of way of a number of these railroads also served as utility rights of way, particularly for water service, and so were preserved, and in the late 20th century enhanced as walking, jogging, and bicycle riding trails in the central portion of the county. Point Isabel Regional Shoreline in Richmond is the largest dog park in the country. Adjoining or nearby these parks are lands of the East Bay Municipal Utility District. These require special annual permits for hiking, bicycle riding and horse riding, available for a small fee. At least one member of a party traversing these areas must have such a permit. Since 2003, four Indian gaming casinos have been proposed in Richmond and the surrounding area of West Contra Costa County. Rossmoor - a senior development incorporated into Walnut Creek (not to be confused with the Southern California Rossmoor). Saranap - an unincorporated residential area between Walnut Creek and Lafayette, centered around the site of a (now-gone) inter-urban train station, comprising much of ZIP Code 94595. ^ For a collection of observations of the Mexican provincial culture and trading practice (most notably in the acquisition of cattle hides for eastern U.S. shoe manufacturies) see portions of Two Years Before the Mast, a first-person narrative of a seaman's voyage to California starting in 1834. ^ "Mount Diablo". Peakbagger.com. Retrieved February 6, 2015. ^ a b c "State & County QuickFacts". United States Census Bureau. Retrieved April 3, 2016. ^ "Contra Costa County, California Official Website". Retrieved January 24, 2009. ^ "Contra Costa County, California Official Website - Visiting". Archived from the original on February 27, 2009. Retrieved 2009-01-24. ^ "Contra Costa County Mexican Land Grants". Lib.berkeley.edu. June 16, 2003. Retrieved September 22, 2012. ^ U.S. 1850 California Census asks state of birth of all residents and gets about 7300 residents born in California. Adding the approximate 200 Hispanics known to be in San Francisco (1846 directory) and an unknown (but small as shown in 1852 CA Census recount) number in Contra Costa and Santa Clara county whose census was lost gives less than 9,000 Hispanics state wide. ^ Lyman, George D. John Marsh, Pioneer: The Life Story of a Trail-blazer on Six Frontiers, pp. 237-49, The Chautauqua Press, Chaugauqua, New York, 1931. ^ U.S. 1850 California Census counts 92,597 residents but omits the residents of San Francisco (estimated at about 21,000) whose census records were destroyed by fire. Contra Costa County (estimated at about 2,000 residents) and Santa Clara County (estimated at about 4,000 residents) 1850 records were "lost" and also not included. ^ "East Bay Regional Parks | Embrace Life!". Ebparks.org. Retrieved September 22, 2012. ^ "Demographic Profile Bay Area Census". Archived from the original on December 27, 1996. ^ "Contra Costa County, California - Fact Sheet - American FactFinder". Factfinder.census.gov. Retrieved September 22, 2012. ^ "County Membership Reports". thearda.com. Retrieved August 22, 2011. ^ "County Membership Reports". thearda.com. Retrieved August 22, 2010. ^ Berkowitz, Dovber (October 21, 2015). "Where Does the Soul Go After It Departs This World?". ^ a b c d e f g h i j k l m n o p Contra Costa County Elections Division. . Retrieved 2016-11-29. ^ "CBS News article". January 31, 2011. Retrieved March 2, 2011. ^ "CCTimes article". February 5, 2012. Archived from the original on September 4, 2015. Retrieved February 5, 2012. ^ Hall, Carl (August 25, 2005) "East Bay Newspaper Chain Sold", S.F. Chronicle. Retrieved 2007-08-16. ^ "blackhawkmuseum.org". blackhawkmuseum.org. November 17, 2012. Retrieved November 22, 2012. ^ chinn, harvey. "The Martinez Adobe - John Muir National Historic Site - John Muir Exhibit (John Muir Education Project, Sierra Club California)". ^ "Museum of the San Ramon Valley". museumsrv.org. Retrieved November 22, 2012. ^ "Briones Regional Park". Ebparks.org. Archived from the original on October 11, 2004. Retrieved September 22, 2012. ^ "Diablo Foothills Regional Park". Ebparks.org. September 27, 2012. Retrieved November 22, 2012. ^ "Las Trampas Regional Wilderness". Ebparks.org. Retrieved November 22, 2012. ^ "Iron Horse Regional Trail". Ebparks.org. October 17, 2012. Retrieved November 22, 2012. ^ "California Riding and Hiking Trail". Ebparks.org. Archived from the original on March 21, 2018. Retrieved November 22, 2012. ^ "Contra Costa Canal Trail". Ebparks.org. September 13, 2012. Retrieved November 22, 2012. ^ "Delta de Anza Regional Trail". Ebparks.org. Retrieved November 22, 2012. ^ "Briones to Mt. Diablo Regional Trail". Ebparks.org. Retrieved November 22, 2012. ^ "Lafayette-Moraga Regional Trail". Ebparks.org. Retrieved November 22, 2012. Wikivoyage has a travel guide for Contra Costa County. Wikimedia Commons has media related to Contra Costa County, California. ^ Marin, Solano, Sonoma and Contra Costa Counties' borders come to a common point c. 6 miles into San Francisco Bay (coming from the north). Thus, Sonoma County is an adjacent county. Hittell, Theodore Henry (1876). The codes and statutes of the State of California. A. L. Bancroft. pp. 514, 515. Retrieved August 20, 2012.